She washed her hair with apple cider vinegar. The result is AMAZING! Apple cider vinegar has many benefits for your health, but lately, its potential to treat beauty problems is being discovered more and more. In this sense, following an ACV based remedy for a period of time can bring you satisfaction: a shiny, silky and long hair. And you will forget about hair loss! This ingredient improves the condition of your scalp by balancing the pH level, stimulating the blood circulation and combating bacteria and dandruff. Before applying the apple cider vinegar on your hair and scalp you need to know that every type of hair is different and needs different assistance. If you have a long, thick or curly hair then you should use this remedy two times a month: combine half a cup of apple cider vinegar with 1l of water. Shampoo your hair as usual and rinse your hair with this mixture, instead of using a conditioner. For a dyed hair, we recommend you to rinse your hair once a month with this mixture: ½ cup of apple cider vinegar with 2 cups of tepid water. 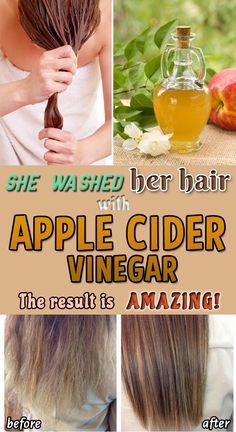 If you have a straight hair, no matter if it is short or long, you should rinse your hair with the following composition one time every week: 1 tbsp of ACV mixed with 1 cup of tepid water. Note: Make sure that after you apply one of these natural remedies you rinse your hair with tepid water, in order to remove the acid from your hair.